I’ve started off with a slightly different approach that each student should start of with a space of their own to manage and consider the implications of becoming the owner of their own story. Reification, of many kinds, is a major problem in academic uses of language. As the Republicans dismantle governments' bureaucratic structures and corporations continue to increase offshore management, administration of universities will be the only place for college graduates to find work. like OpenPedagogy? . . . a movement that grows out of but exceeds OER . . .
we might think about Open Pedagogy as an access-oriented commitment to learner-driven education AND as a process of designing architectures and using tools for learning that enable students to shape the public knowledge commons of which they are a part. This could maybe be something like a definition of open pedagogy, from these authors? Recognizing that any definition is not comprehensive and thoughts about these issues are in flux. Embedded in the social justice commitment to making college affordable for all students is a related belief that knowledge should not be an elite domain. I really like this point, that knowledge creation is a social justice issue. The next sentence really drives it home and makes a lot of sense to me. First, we want to recognize that Open Pedagogy shares common investments with many other historical and contemporary schools of pedagogy. I have often wondered about this--a number of things that many of us are excited about re: open pedagogy are also part of other pedagogical theories. So I wonder: what is "open pedagogy" adding to the other views? What does "open" bring that the others don't? We hope that this chapter will inspire those of us in education to focus our critical and aspirational lenses on larger questions about the ideology embedded within our educational systems and the ways in which pedagogy impacts these systems. At the same time we hope to provide some tools and techniques to those who want to build a more empowering, collaborative, and just architecture for learning. I might reverse the priority of these: for me, OEP is first a worthy learning practice, and second a practice that can question and evolve ideology. Does the latter grow out of the former? 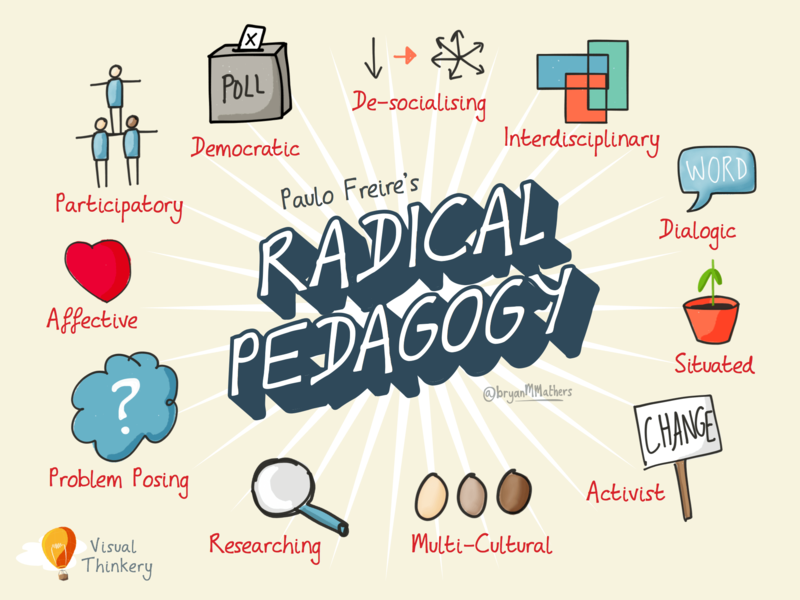 “Open Pedagogy,” as we engage with it, is a site of praxis, a place where theories about learning, teaching, technology, and social justice enter into a conversation with each other and inform the development of educational practices and structures. This is a best practice: before we define terms, let's clarify goals. OER-Enabled Pedagogy is the set of teaching and learning practices only practical in the context of the 5R permissions characteristic of open educational resources. Some people – but not all – use the terms “open pedagogy” or “open educational practices” synonymously. OER-enabled pedagogy is the OEG's preferred name for what other's might call "open pedagogy" or "open educational practices". David Wiley blogs about this specific naming. This is, fundamentally, about the dream of a public learning commons, where learners are empowered to shape the world as they encounter it. On open enabling the public learning commons. Knowledge consumption and knowledge creation are not separate but parallel processes, as knowledge is co-constructed, contextualized, cumulative, iterative, and recursive. Education as the consumption AND creation of knowledge. So one key component of Open Pedagogy might be that it sees access, broadly writ, as fundamental to learning and to teaching, and agency as an important way of broadening that access. What Was the First MOOC? use this as a timeline event? Advocacy and use of free and/or open source tools and software wherever possible and beneficial to student learning;Integration of free and open content and media in teaching and learning;Promotion of copyleft content licenses for student content production and publication;Facilitation of student understanding regarding copyright law (e.g., fair use/fair dealing, copyleft/copyright);Facilitation and scaffolding of student personal learning networks for collaborative and sustained learning;Development of learning environments that are reflective, responsive, student-centred, and that incorporate a diverse array of instructional and learning strategies;Modeling of openness, transparency, connectedness, and responsible copyright/copyleft use and licensing; and,Advocacy for the participation and development of collaborative gift cultures in education and society. Can open be the new compact? Over time, these qualities drove American society to redefine the goal of higher education, which became, in Kerr’s words, “to serve less the perpetuation of an elite class and more the creation of a relatively classless society, with the doors of opportunity open to all through education. open was the original goal of land grant institutions. permeable boundaries and identities. Is permutation an important metaphor? John Seely Brown suggested open pedagogy would emerge. Open pedagogy could be considered as a blend of strategies, technologies, and networked communities that make the process and products of education more transparent, understandable, and available to all the people involved. There is an insight here with pedagogy. Not sure what. As we use open pedagogy we oursleves become more open. Maybe part of the them that open is really a journey and state of mind. Open pedagogy may have positive results for learners. I think this has more to do with the domian rather than the nature of open learning. I coudl have open learning in basic physics where mroe traditional models of measurement coul;d track progress. Is this a benifit or a quality. Chick and egg? maybe networked , rather than expansion. I find students need many scaffolds of community to start. A key principle is agency. Though could be combined with choice. Yes we can (and shoudld) openly license our course work but what in our couse design must shitf when working in the open? All of the descritpions of open pedagogy seem to put the openness on the content and artifacts and not in the learner. This sets up a binary. You can not be "open"unless you are fully open? What does that mean when I draft a document on Google Docs? I have granualr control over permissions but someone own's my data. Is it open? Must learning occur on on a FOSS (free and open source software) to be considered part of open pedagogy? So life long learning can only happen in "the open?" Seems like Hegarty is describing their ideal arc rather than the arc-of-life learning. I also wonder when we stop describing learning and we are just talking about being a human. Is there a difference? Essential in development of open pedagogy. Really inseparable. It is the tool of the action, and the activity lead to the evolution of the tool. Not necessary in truest sense. Look at Rhizo14 and Rhizo15 for great learning with no direction and no assignment. Reciprocal teaching has always focused on strategy instruction what I see is more a strategy exchange in open pedagogy. There is a collective toolbox and some people hold more parts than others. This is much smaller than remixing. Though in many ways a summary is a remix. Still I wonder if the effet size would hold as the degrees of freedom of the derivative work grow. What does teacher clarity mean when the community is the teacher which is often the model found in open pedagogy? Does a non-derivative license by definition make something open or less open? This is critical. In most fluent of open pedagogy spaces participants are there to create what they believe is the highest expression of art in their domain. Hattie's work is also very influential in my world view. In fact it forms the background to all the facilitating I do around teacher observation. Yet Open Pedagogy speaks to so much more than efficacy. In many ways it isn't always as efficient, yet the messness is where real learnign occurs. David as written a lot about Open Pedagogy. Explore his stuff. Open is both an attitude and a continuum. Together they make open a journey. When it comes to open pedagogy we are now simply referring to the map and the compass. Some paths are well carved but others are still left unexplored. series of radical educational paperbacks, published by Penguin in the series Penguin Education Specials in the 1970’s. These included: Paulo Freire Pedagogy of the Opprressed ; Paul Goodman Compulsory Miseducation; Ivan Illich De-Schooling Society; Everett Reimer School is Dead. There are clear signs that some move towards Open Pedagogy is in fact happening. At SALTISE, last week, @Downes made it quite clear that Open Education is about openness, not merely about cost.